Overview Label Gun is a font based on the scans of REAL impressions made into a plastic ribbon by a labelling machine. Labelling machines were commonly used throughout the 1960s and 70s. The common result was that the strips of tape were not always parallel. When using the Label Gunfonts, you might want to create that element of realism to your setting technique by typing each line separately and then randomly rotating them by a degree or two (changing the angles from line to line). If you want to be extra radical, you could rotate each line by several degrees and even overlap the lines in some spots. 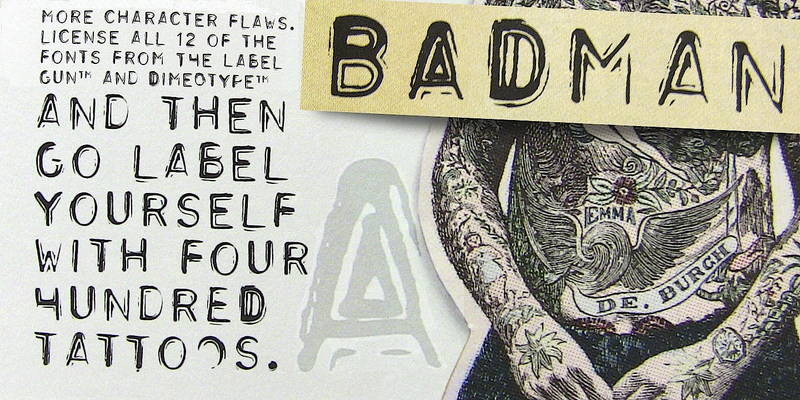 Most of the original labeller tape was either black, blue, red or dark green, with the resulting imprints showing up in white on the plastic. If you wish to modernize the colour scheme, you might even try colouring the the type, as long as you are careful to maintain a significant contrast between the type and the background ribbon colour. If you are looking for a companion family which is a little less grungy, with fewer dropouts and different impression effects, check out our DimeOtype fonts. In the PC version of this font family the style names are slightly different from those used in the Mac versions. But the fonts are otherwise identical.